But… surgery, that’s such an expensive leap or paying out the high costs for Botox or other fillers 1-2 times per year. Introducing an exciting safe and gentle alternative to surgery! Thanks to the ACCOR Cosmetic Corrector which is an advanced Plasma Pen, you can now refresh and rejuvenate your face, neck and body and enjoy substantial visible and measurable results – FAST. Better still, the treatment is practically painless and very affordable, with often one treatment being sufficient. 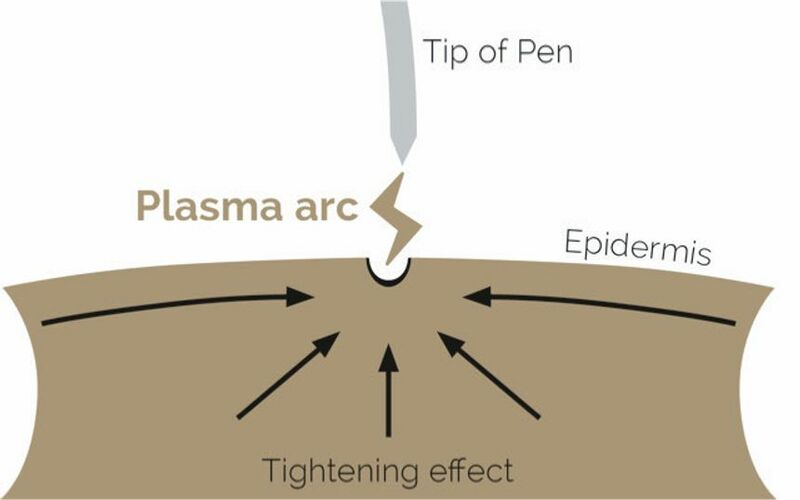 The ACCOR Plasma Pen creates a tiny electrical arc (Plasma arc) at its tip. As the plasma arc touches the skin it vaporises a micromillimeter sized dot of the surface of the skin (the epidermis), which instantly tightens up the surrounding skin. When several dots are applied close together, this results in a tightening of excess skin. The Pen does not actually touch the skin at all and the results are often visible immediately. Before any treatment is carried out, a topical anaesthetic cream is applied to numb the area, so that it is practically painless. This depends on each individual but generally 1 treatment is usually sufficient. Of course, everyone is different and this will be discussed during a FREE consultation. Yes it is safe. An ACCOR Plasma Pen treatment is non-invasive and is much, gentler than an operation. However it is still a treatment so there may be minimal swelling for about 2 days. The treatment leaves tiny scabs which drop off after 4-10 days. As each scab falls off it may leave a small red mark which usually disappear after a week, although it may take longer in slow healers. Do not worry about scarring either. The ACCOR plasma pen only treats the epidermis – not the dermis (that causes scarring). When applied the heat is 42 degrees, which is hot enough to contract the skin but not hot enough to burn or scar. We will of course provide you with an Aftercare Information Sheet but it is important not to rub or scratch the scabs off! They need to fall off on their own. You should avoid anything that may make you sweat whilst the scabs are present. © 2019 Copyright Beauty 969. All Rights Reserved.